Peru is the third largest country in South America. The official language is Spanish and the customs and traditions are influenced mainly by the European-descended cultures and the indigenous Amerindians who make up around half of Peru’s population. Much of Peruvian etiquette is similar to that of other Latin American countries, but a few traditions that are unique to Peruvian and Amerindian cultures are retained. As a visitor or holidaymaker in Peru, it is polite to become familiar with some basic customs and etiquette. In Peru, it is thought polite to greet all people that you come into contact with, including shop assistants and bar staff, however long or short your acquaintance might be. Learning some simple Spanish phrases will enable you to do this, as it is considered good manners to greet someone with a salutation such as “buenos dias” (good day). Smiling is also important in making a good first impression. Don’t be surprised if you are addressed as “gringo/gringa” (meaning foreigner) or “mister” – these are not derogatory terms in Peru and shouldn’t be taken as such. Peruvians tend to be formal and conservative, and this is especially so around the Andes region. The indigenous Amerindians are particularly reserved in their demeanour, and can often come across as shy or aloof. Eye contact with visitors to the community will often be minimal. It is therefore bad etiquette to stare or make continual eye contact. You should respect the modesty and reserved nature of many Amerindian communities, so adhering to similar behaviour and modest dress codes would be seen as a sign of respect. Outlandish, forthright and boisterous conduct within such groups would be considered quite offensive and completely out of place. Handshaking between men and women is the most common form of meeting and greeting in Peru. Women may give and receive a kiss on the right cheek, however this is a slightly less formal sort of greeting and should only be initiated by your Peruvian counterpart. During introductions you should expect to be asked seemingly personal questions regarding your relationship status, marriage and family. You might even be asked about your job and subsequent financial status. Although these questions might be construed as invasive and even nosey, you should understand that in Peru it is considered polite to show an interest in such matters. However, try to answer such personal questions with a degree of modesty, as boastful and ostentatious behaviour – particularly where financial status is concerned - is frowned upon and considered quite vulgar. 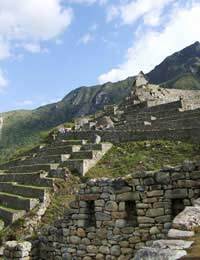 Peru has many awe-inspiring landscapes and historical landmarks. It is perfectly acceptable to photograph many aspects of Peruvian culture. Most of the time, you will be able to freely take photographs, but always check that it is appropriate before you start snapping away. Also be aware that some religious buildings prohibit the use of cameras and videos. Most buildings pertaining to military or governmental activities will be strictly out of bounds as far as photography is concerned. If photographing a particular person, you should always ask your subject beforehand to ascertain if this is OK. Usually, the answer will be yes, but you should be aware that in some instances, it is expected that your subject will ask for a ‘tip’ in return. You can offer a small amount of money if you feel that you have inconvenience them at all. You should be aware that punctuality is not considered to be of particular importance to many Peruvians. In fact, it is expected that you turn up anything from 30 minutes to a fully hour after a stated ‘start’ time of any event. If you have been invited to a club, party or dinner at a restaurant or Peruvian home, you should always make an effort to dress well for the occasion, As city-dwelling Peruvians tend to generally dress more formally, it is vital that you are well-groomed for such events. Unless you are very well acquainted, shorts, jeans and sportswear are not appropriate – skirts and dresses for women and a shirt and trousers for men are adequate. It is proper etiquette to bring a small offering to your host or hostess’s home. Popular gifts include wine, chocolates, cakes and sweets or flowers. You should avoid anything too large and showy, as this could be seen as a blatant display of wealth and however generous your Peruvian acquaintance may be, they may not be able to reciprocate the gesture. That was great. i learned alot. Crazy etiquette in some places huh?